As with The Met Breuer’s exhibit “Unfinished” two years ago, “Like Life” appears to equal parts thematic omnibus and compendium of oddities. 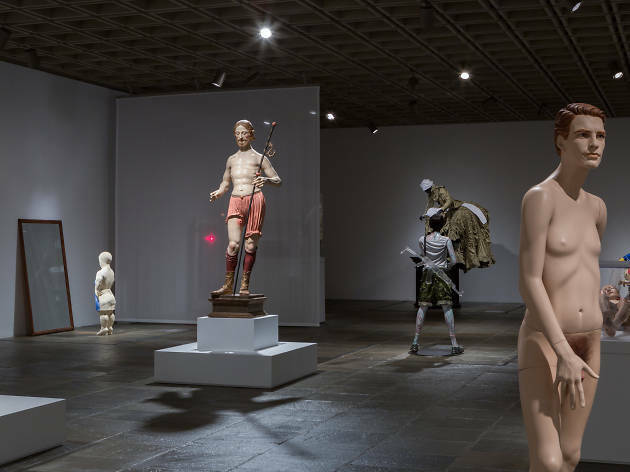 Filling two floors with seven centuries of figurative sculpture that strive for realism of one sort or the next, “Like Life” feels at times like an exercise in flaunting the Met’s skill at prying rare objects from European museums. An El Greco sculpture from the Prado in Madrid? Check. An 18th-century life-size anatomical Venus from Budapest? Check. The clothed skeleton of English philosopher Jeremy Bentham (1748–1832), his head reconstituted in wax, from University College London? That’s here, too. Despite the cabinet-of-curiosities vibe, “Like Life” ultimately triumphs as a radical rethinking of how the Met presents contemporary art within the context of its encyclopedic collection. The show starts with the idealized whiteness of classical statuary, based on the Renaissance taste for scrubbing excavated Roman marble. Admirably, the show addresses the adverse effects of that predilection on ideas about race and beauty, both through wall texts and works like Fred Wilson’s The Mete of the Muse (2006), which pairs reproductions of an ancient Egyptian goddess in black and an Aphrodite in white. Nearby, The Tinted Venus (circa 1851–56), by British sculptor John Gibson, serves as a counter-illustration as to why monochrome figures retain their allure. A marble delicately painted in naturalistic hues (much as Greek and Roman statues actually were), it resembles a life-size china figurine, calling to mind Jeff Koons’s odes to kitsch, such as his monumental porcelain sculpture Michael Jackson and Bubbles (1988), astutely placed just behind the Gibson. Still, much of the show’s contemporary art has a tough time competing with the compellingly weird historical material. Goshka Macuga’s To the Son of Man Who Ate the Scroll (2016), billed as an “android,” is an animatronic man who moves and gestures as he spouts a stream of quotations. While the piece is uncanny, it’s no more sophisticated than Disneyland’s speechifying Abe Lincoln. Moreover, it lacks the disquieting charge and creepy prurience of an 18th-century waxwork on display called Sleeping Beauty. Borrowed from Madame Tussauds, this chastely titillating damsel lays on a couch, her chest heaving rhythmically. Unsettling yet riveting, she confounds our expectations of the everyday, just like life. The Met Breuer, 945 Madison Ave (212-731-1675, metmuseum.org). Through July 22.